Detail of a generated dungeon. This project is a school project. The purpose is to generate a dungeon procedurally with like-shaped rooms : we need a start room, enemies rooms, a boss’s room, an ending room and the rooms of keys/bonus (Like in the Binding of Isaac). The generated donjon is cut in several levels which require a key to reach it (recoverable in a room of key). 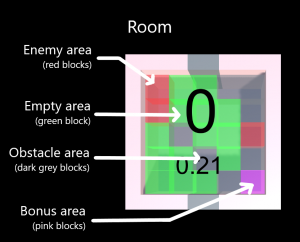 Inspired by the work of Calvin Ashmore (https://smartech.gatech.edu/bitstream/handle/18 53/16823/ashmore-thesis.pdf), we keep track of the intensity of our rooms to place key’s room where the tension is the higher. We also generate procedurally the content of rooms by using a generative grammar to control a little bit the creation. These rooms are cut in grid of 5×5 cells which can have the type : Empty, enemy, bonus or obstacle. Finally all cells in front of doors are empty, so the player is not blocked when he/she enter in a new room. We also want that there is always a path to reach the next rooms. The two big parts of my work are the generation of donjon and the contents of rooms. Help Wonder Tsum to reach the end of the puzzles. Make it grow, but not too much. Divide it when you have to. Don’t worry, it won’t get hurt ! If you’re stuck, just retry ! This game was made in 72h with Unity for the LudumDare 40. – Sound integration: integrate the work of our sound designer (FMOD). 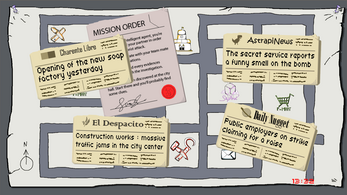 Heavy Brain is a two-player puzzle / exploratory game . Play as either a cop on the field or a remote operator. Find the hints, share intel (orally) in order to stop and kill a bomb terrorist ( before he kills you ). This game was made in 36 hours with Unity and Unet(for network communications). Cake Arena is a multiplayer FPS online. You have to find weapons and ammos to kill other players. All the objects falls randomly from the sky. There are zombies that defend resources. You can run or fight but they kill you with only one hit. To find your way on the island, you have a minimap. The first player to reach 5 frags win the game ! 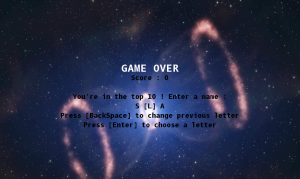 This game was made with Unity and UNet (for the network communication). I was alone on this project, it’s a school project. The main purpose of this project was to try the Unet and make one of my first game with network communication! Licht is a horror game developped for the AsylumJam 2017. You play as an engineer responsible for checking the operation of a submarine base before the arrival of the team of researchers who will use it. You have to fix an electricity problem in one of the rooms and you make a macabre discovery on the way. The rescue team will take some time to reach you and strange leaks require your attention, threatening to flood the base. However, this isn’t only one of the threats you will have to face. Space shooter is one of my very first games. 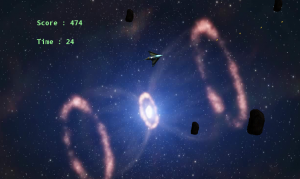 It’s a very simple shooter where you need to destroy some asteroids. When you shoot and asteroid, it divides in two small parts. Each level is faster than the previous one and you have to survive as long as possible. When your game is over, if you are in the top 10, you can enter your nickname : Your Highscore is saved in the Leaderboard. You can also change your controls. This game was made in C# with the XNA Framework, in 2014.